Description: This 1917 K4s was an example of an Altoona Shops built Pacific, here in a gritty industrial setting. Note the tender is loaded with coal, ready for a long haul! Date is approximate. 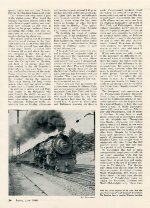 Description: Here is page three of a six-page article by Al Rung about the Pennsylvania-Reading Seashore Lines. It is entitled "Three months feast, nine months famine" and was published originally in the June 1948 issue of "Trains" magazine, page 24. Shown here is Pennsylvania Railroad engine #2445, a K-4S (4-6-2) "Pacific" built in Juniata during 1917 and retired in September of 1953. Photo by Mr. Bert Pennypacker. Description: Here is page 11 of a 40-page booklet published by Harry P. Albrecht entitled "A Picture Study Of The K-4." First issued in October 1967, revised in September 1976. Section Caption: "On The Pennsylvania-Reading Seashore Lines." Both of the locomotives pictured here are Pennsylvania Railroad K-4S (4-6-2) "Pacifics." Top Photo: #2445 was built in Juniata during June of 1917 and retired in September of 1953. Bottom Photo: #5427 was built by the Baldwin Locomotive Works during February of 1927 and retired in April of 1956.